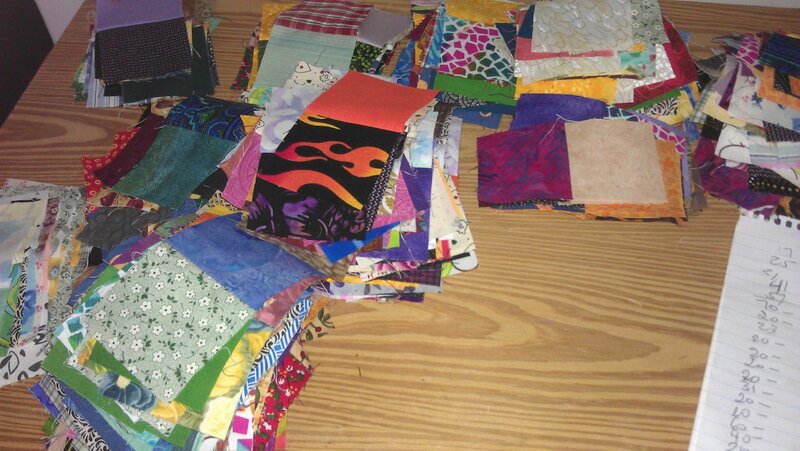 Squares in baggies AFTER I’d used up 1160 of them! Yes, I counted how many pairs I had — see notebook on the right. After a few more days/weeks of avoiding the next task, I got into it while I was on leave just before Christmas. And that task was deciding how to put these pairs together. It would be easy to just grab a pair and then stitch the next pair I grabbed to it, but I wanted to make sure I had a balance of lights and darks, brights and pastels, etc. so I placed the pairs on my design board (thank goodness for that design board — this task would have been a nightmare otherwise). 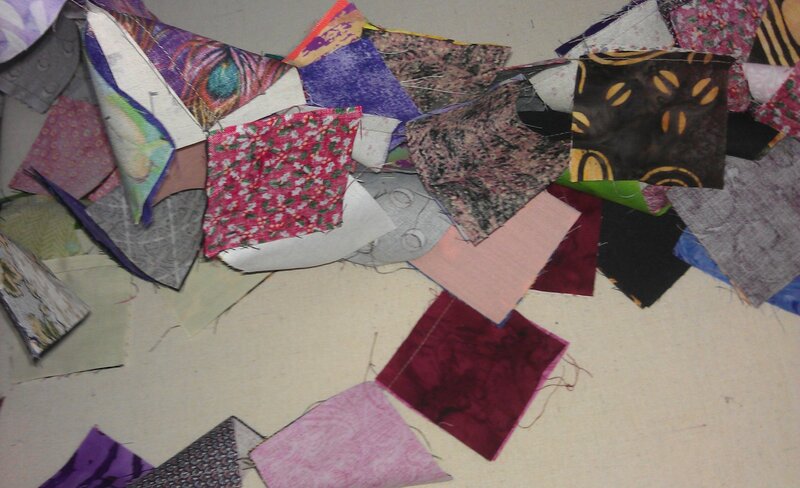 Once I was happy with the ‘randomness’ of colours, tonal values etc., I stitched the first row of 10 squares (5 pairs) together, then pinned them back up. Then the next row and the next until all 10 rows were stitched. Next came more pressing, this time pressing all the seams in one row the same way, then in the opposite direction for the next row and so on until all 10 rows were pressed. I pinned each row back up on the design board as it was pressed. Next came joining rows 1 and 2 together, then 3 and 4, 5 and 6 and so on, nesting the seams together, and pressing the new seam in one direction. I now had 5 pairs of rows of 10, so these had to be stitched together too, and the seams pressed. Finally I had a single block of 100 squares! 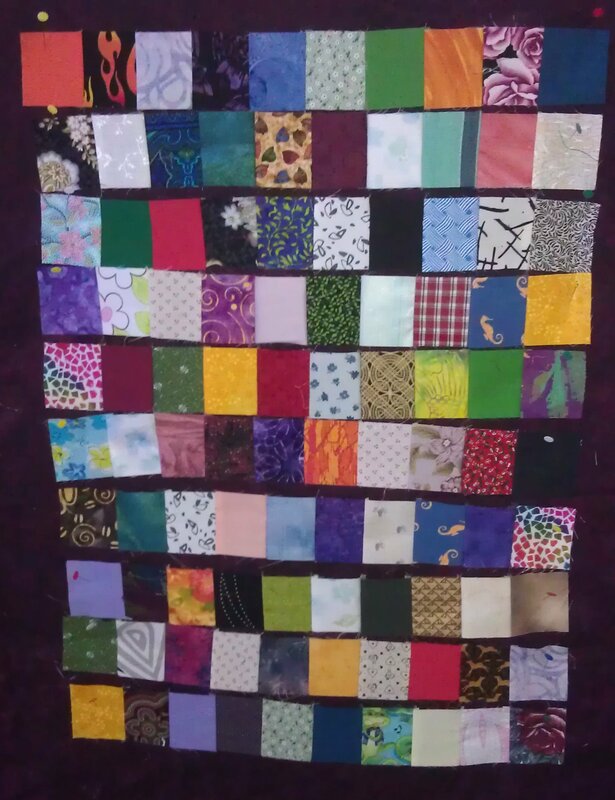 I think I’ll need six 100-square blocks for my lap quilt — 2 across, and 3 down. 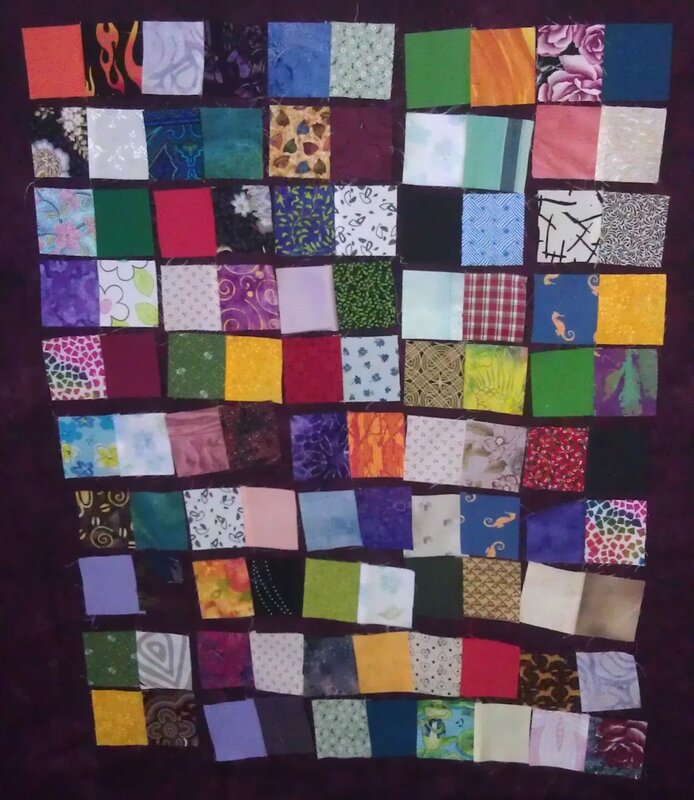 That’s only 600 squares from my stash of 2000+ 2.5 inch squares…. Already I reckon I’m about 10 hours (or more) into it, with many more hours to go. 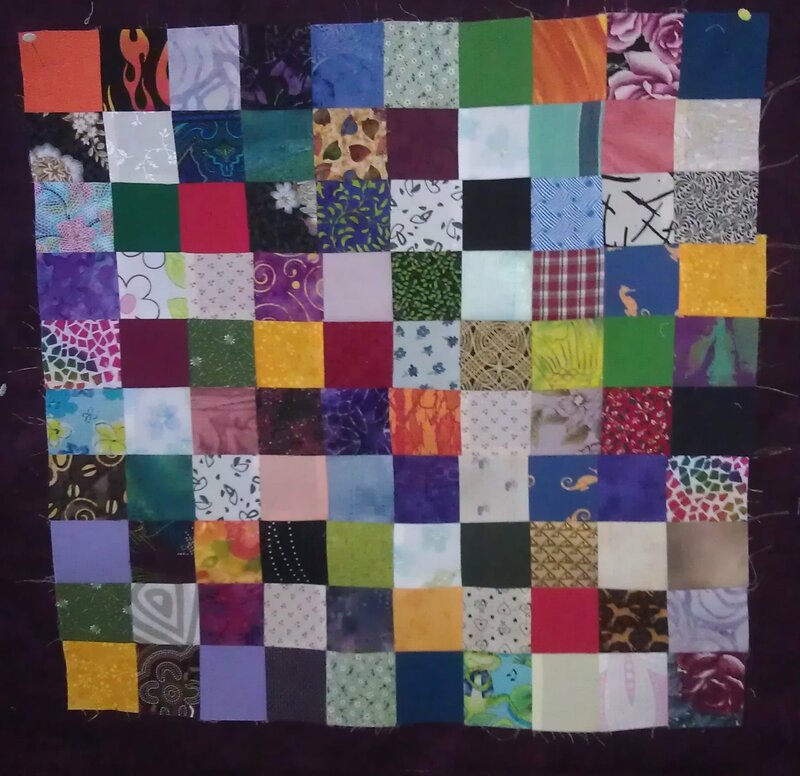 Anyone who thinks that paying $300 for a hand-made quilt at a craft fair is too much, has NO idea of how much time and effort goes into it (see this blog post for the costings for a quilt I made a couple of years ago: https://rhondabracey.com/2011/11/06/cost-of-craft-work/). I have two ‘protective’ pieces of cultural heritage in my house (actually, I probably have many more, but these ones are pretty unusual for someone living in Australia). The first is an assegai that came from my maternal grandparents, who were both born and raised in South Africa, and who came to Western Australia in 1927. They returned to South Africa a couple of times in their later years, and my grandmother died there while visiting with her family on one of their trips back (1978); my grandfather died in Western Australia in 1994. In their house they had a few African pieces, and for some reason I have their old assegai. I don’t recall how I got it — whether my Mum gave it to me after my grandad died, or whether I asked for it (though I can’t recall ever doing so, as I don’t even think I can remember seeing it when I used to visit as a child). Anyhow, I’ve always known it as an assegai, though some might call it a spear. When I checked Wikipedia, the description on an assegai perfectly fits what I have — a wooden shaft, with a crude iron spear, which is about 30 cm long. I guess I always knew it was some sort of weapon, but that Wikipedia article confirms it. The other is a Mohawk ‘dancing stick’ that I purchased from a Tyendinaga Mohawk store in 1986 when I lived in Ontario, Canada. I can vividly recall going into the store and wandering about looking at all the stuff. The only thing that really drew me in the store was this dancing stick, which was hanging high on the ceiling well out of reach and which wasn’t for sale, according to the chap serving in the store. He said it was a ceremonial stick and it wasn’t for sale as they still used in it ceremonies and it was a traded gift from another tribe. It was only in the store for display and storage purposes. At least, that was his story and I had no reason to disbelieve him. I kept coming back to it and looking up at it, and kept asking if it was for sale, and about the history of it and what it was made of (deer antler, white tailed deer hide, deer suede, eagle feathers, and blue and red beads). Then I’d move off, then come back. I was drawn to this piece of Canadian First Nations culture for some reason. I was the only one in the store, and he could see me going back to it time and again. Eventually, I decided it was time to move on. But on my way out he stopped me and said he could see how drawn I was to this piece. So he sold it to me, knowing it would go to Australia to live out its days. I can’t recall how much I paid for it, but that’s totally irrelevant anyway. 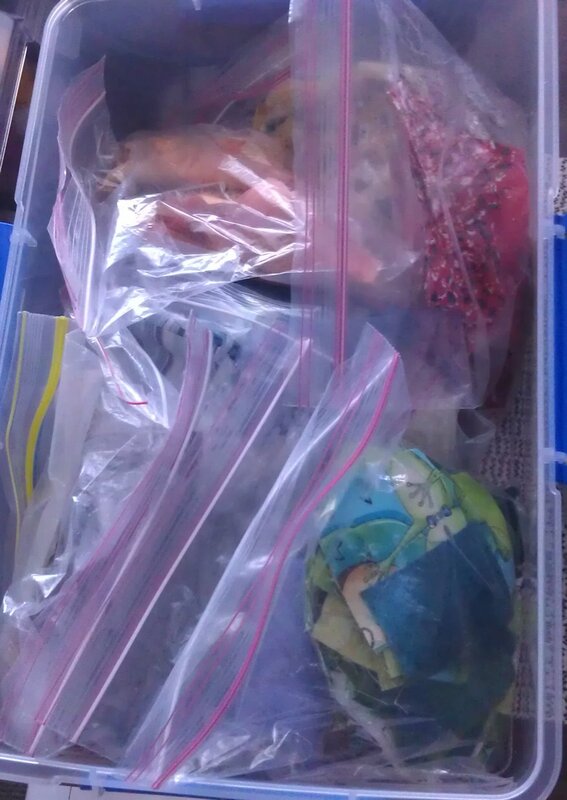 Australian Customs is notoriously harsh about ‘fur, skin, and feathers’, so when my box of belongings arrived in Fremantle Port some four months after I’d sent it home from my year in Canada, I had to go down to Fremantle Port Customs to claim it and to declare the dancing stick. There was always a risk that it would be confiscated and destroyed by Customs, but that was a risk I was prepared to take. The guy at the counter was really good about it — he said it would have to be gamma radiated, but as their unit was a fixed size, they’d have to cut the stick in two! However, he said they’d try to cut it where the cut couldn’t be seen. A week or so later I got a call to come pick it up, and when I did so, I couldn’t see where they’d cut it in half. The guy at the counter told me they’d pushed back the deer suede and cut it in half there, then had joined it by using a piece of dowel in the centre and gluing it back together again. I still cannot see the cut! The main reason I’ve written this blog post is so that I have some documented history of these pieces and how I came to own them (or they came to own me!). And the reason I’ve written about them now is that a small piece of deer fur fell off the dancing stick last night (possibly where that cut had been made and the deer hide glued back?) and I glued it back on today. And took some photos of it. My office at home (I work from home exclusively) faces west, so come the afternoon on summer days, the windows get the full force of the sun and heat. Even if there’s a sea breeze blowing from the west (we’re close to the ocean), I have to close the windows (which have blinds, and 70%+ window tinting on them) so the sun and heat don’t come straight into the office and overheat me or the computers. Closing the windows on a hot day and thus preventing the sea breeze from coming in also means turning on the air conditioning (A/C) to keep the computers at a happy temperature (I’ve got one computer that tells me it’s getting hot by ramping up the fan speed once the ambient temperature in the room hits about 28C!). 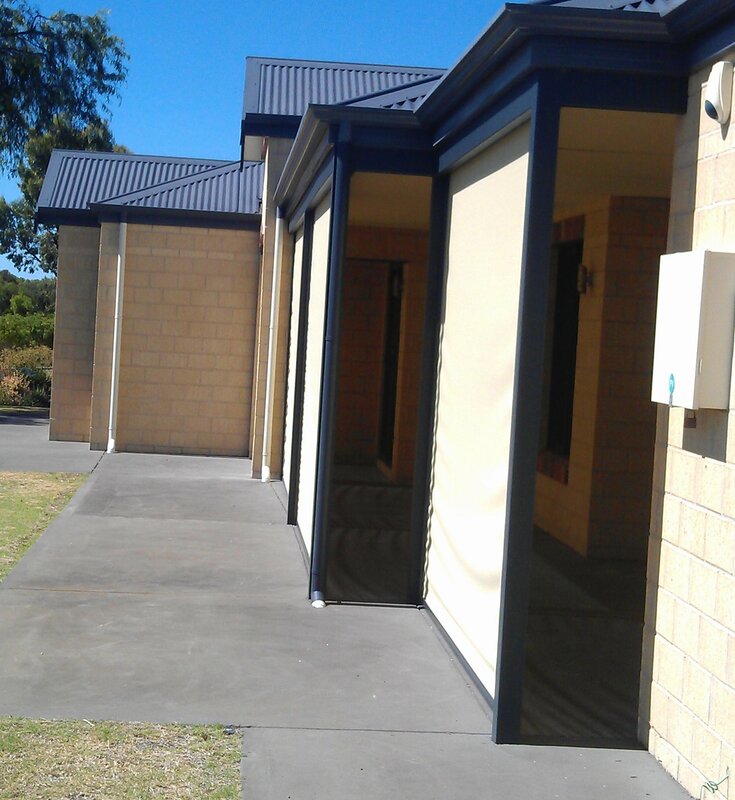 The roller screens were installed just before Christmas and already they’ve made a huge difference on those pleasant summer days where it’s not really hot enough to have the A/C on and the days when a nice cooling sea breeze is blowing. I no longer have to shut the windows mid-afternoon and turn on the A/C, just to keep the direct sun out. I choose a light colour for the screens as the window tinting already adds a lot of darkness to the office, so with the screens down, I can keep the office windows open to catch the breeze, while still letting light in, but not the direct sun or heat. Of course, if it’s REALLY hot, then the A/C comes on AND the screens go down. The day after they were installed, I checked the heat coming through the bedroom windows (which aren’t shaded, but which have the same tinting on them) — I put the back of my hand on the inside of the window and it was HOT. I then went to one of the shaded windows and the temperature of the glass facing into the room was pretty much the ambient temperature of the room. We moved into our house nearly four years ago. When we moved in, the house was three years’ old and the toilets were stained (the water here is fairly hard), as were the plug areas of the white porcelain hand basins in the bathrooms. Below is an example of the staining — yes, these are WATER stains!!! I tried everything possible (e.g. CLR, Steradent, abrasive and non-abrasive cleaning gels, sprays, solutions etc.) to clean them, all to no avail. They remained stained. 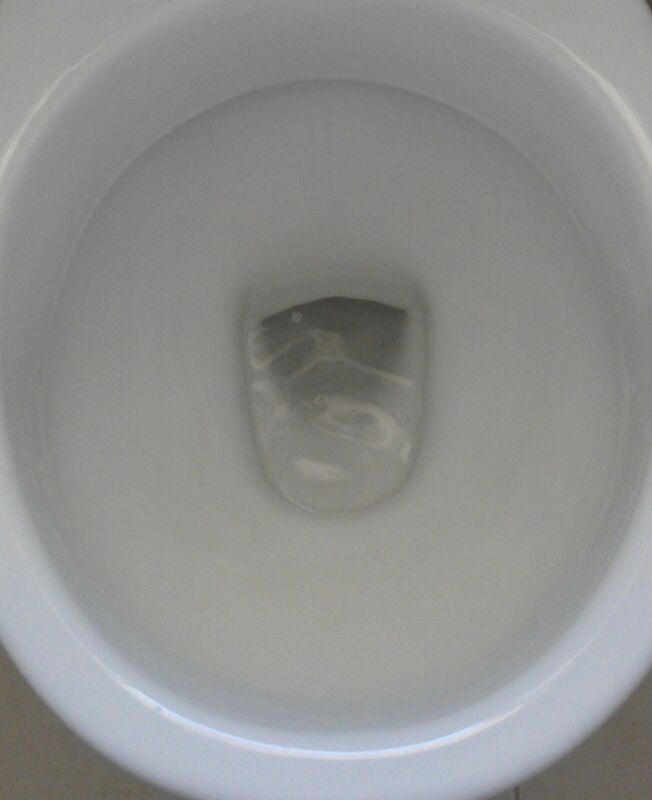 A plumber we’ve used over the past few years said that we’d never clean them as ‘there was a bad batch made about the time your house was built and the porcelain was porous and therefore the stains were ingrained’. Short of replacing the toilets with new ones, we were stuck with toilets and hand basins that were clean but that looked dirty. I even emailed pictures of the stained toilets to the manufacturer back in November (I’m still awaiting a reply…), as the building guy I spoke to said they had a 10-year manufacturer’s warranty. Meantime, we had some roof plumbing work done by a plumber just before Christmas and I asked him about his availability for replacing the two toilets. He came inside, took one look, then beetled back to his van where he grabbed some abrasive mesh. 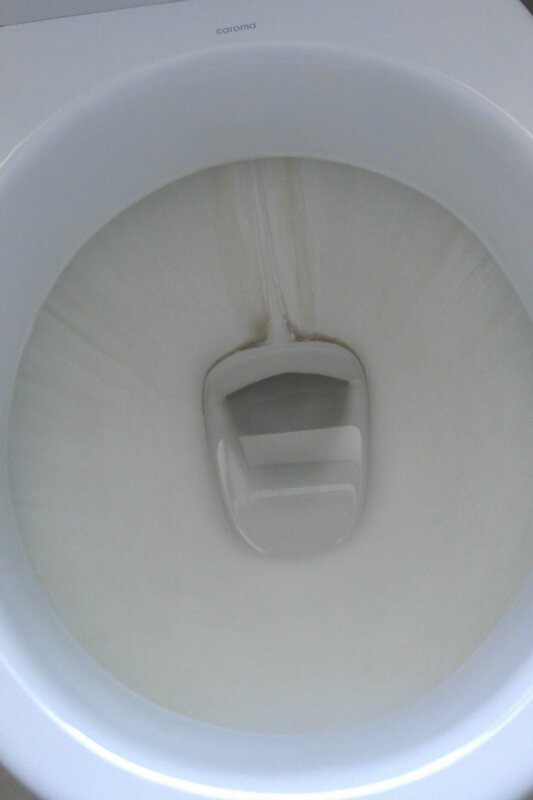 He rubbed a small area of one toilet bowl and voila! The stains had disappeared!!! and there was some milky stuff in the water. He said they were calcium stains (which accounted for the milkiness) and that the porcelain was fine — we just needed to get the calcium off and they’d be as good as new. 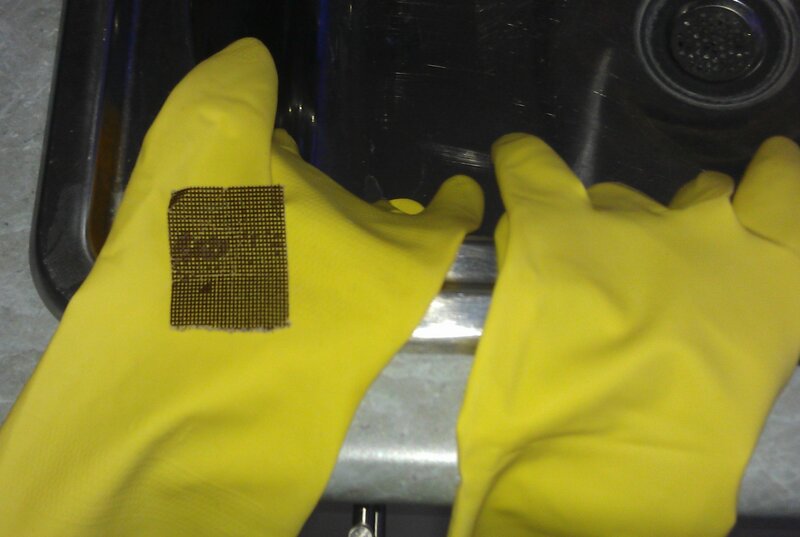 He even gave me about 30 cm of the mesh he used and warned me not to press too hard with bare fingers as I’d cut them. The porcelain doesn’t get scratched by this process either — it was very smooth where he’d rubbed the calcium off. So, wearing rubber gloves, I got to and over the past couple of days I’ve cleaned both toilets and hand basins and they are all shiny new again! And even better, I’ve saved myself the expense and inconvenience of having to replace toilet pedestals and hand basins. All it required was the right ‘tool’ for the job and a fair amount of elbow grease. 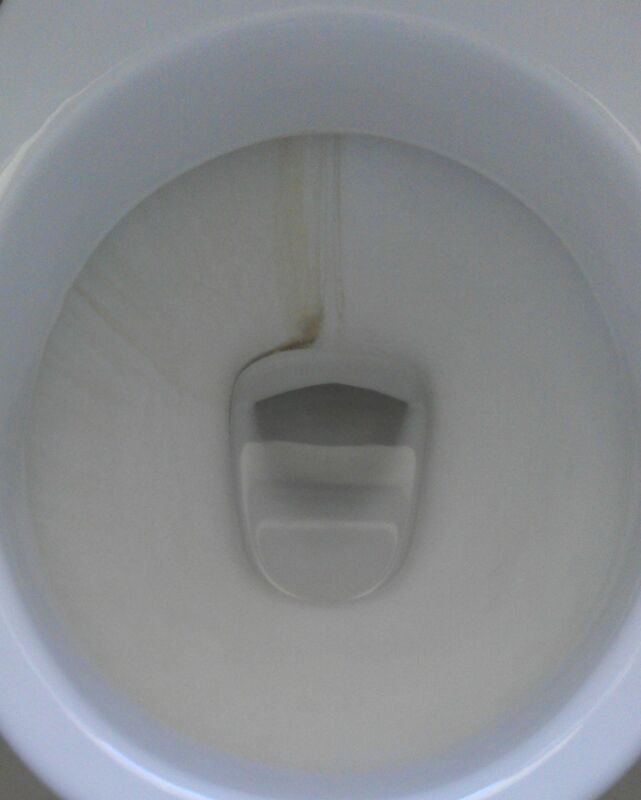 Here’s one of the toilets with one side cleaned, and then finished. Below is this magical abrasive mesh (I think the AO is for aluminium oxide and the 180 is for the grit level). I’ve since attacked a few other areas around the house with this stuff, but be careful as it will scratch metal surfaces if you put too much pressure on it. I haven’t tried it on the glass shower screens yet, but I suspect it may scratch glass too. However, a light rubbing removed rust-type stains from aluminium without obvious scratching. When I’m next in town, I’ll try to buy a roll of this stuff from the plumbing supplies place — plumbers use it for filing off rough edges on copper pipes etc. I figure that I’ll need to give these toilets a periodic rub down with the mesh as our hard water issue isn’t going away any time soon.